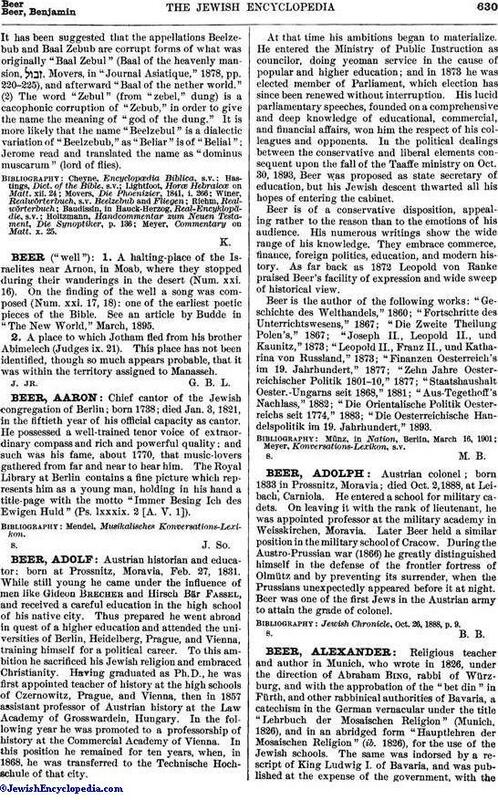 Religious teacher and author in Munich, who wrote in 1826, under the direction of Abraham Bing, rabbi of Würzburg, and with the approbation of the "bet din" in Fürth, and other rabbinical authorities of Bavaria, a catechism in the German vernacular under the title "Lehrbuch der Mosaischen Religion" (Munich, 1826), and in an abridged form "Hauptlehren der Mosaischen Religion" (ib. 1826), for the use of the Jewish schools. The same was indorsed by a rescript of King Ludwig I. of Bavaria, and was published at the expense of the government, with theview of introducing systematic religious instruction in modern form among the Jews. The book is therefore of historic interest as being the result, on the one hand, of governmental initiative in the direction of improved religious education of the Jews, and, on the other, of conscientious labor on the part of the conservative rabbis of Bavaria, who were eager to harmonize modern culture with the ancient faith and practise. By placing the Hebrew quotations from the Bible, Talmud, Maimonides, Moses of Coucy (Semag), and Aaron ha-Levi (Ḥinnuk) alongside of the German text, the author displayed pedagogical tact combined with loyalty to the traditional method of the past. The first part deals, in 32 paragraphs, with the Thirteen Articles of Faith; while the following part deals in 115 paragraphs with duties toward God, in 9 paragraphs with duties toward oneself, and in 49 paragraphs with duties toward one's fellow-men; an appendix treating also of the marriage laws and of the Aaronites. There is a foot-note on p. 57 of special significance by the rabbinate of Fürth, stating that the omission of circumcision does not exclude the Jew from the Jewish community or release him from all other obligations devolving upon the Jew. On account of its conservative tendencies, the book was attacked by an anonymous writer in a pamphlet entitled "Die Reform der Juden und das Beer'sche Lehrbuch," 1827 (Jost, "Neuere Geschichte der Israeliten," i. 127). 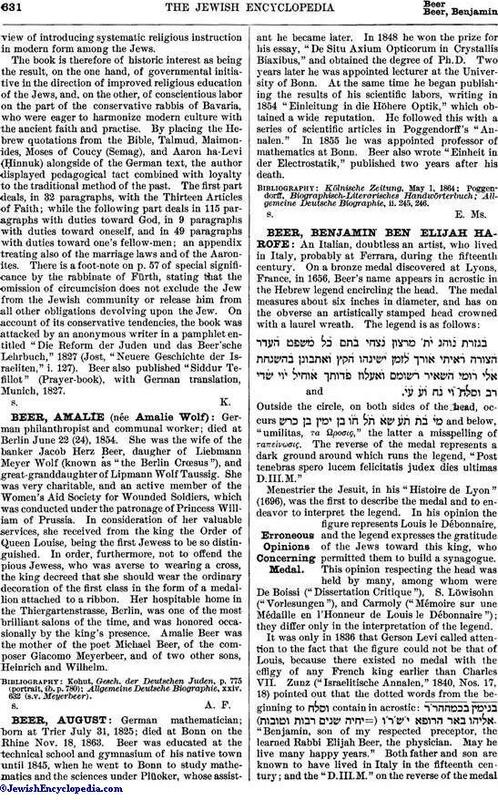 Beer also published "Siddur Tefillot" (Prayer-book), with German translation, Munich, 1827.